I was a bit sceptical about the cabbage dye, but so far was pleasantly surprised. Let’s see how the color lasts, and whether it withstands time and light. 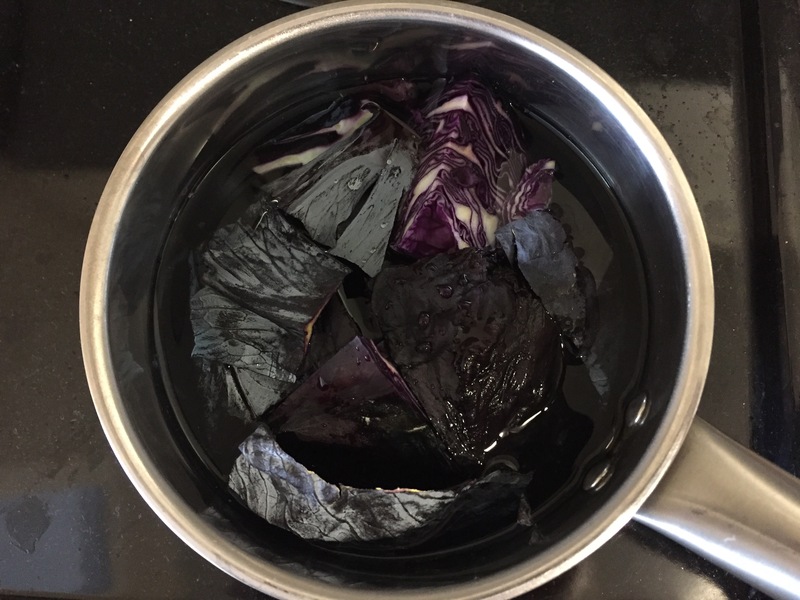 How to make a cabbage dye? Ask google. I did, and found a bunch of step-by-step instructions. I’ll add one more. Got some red cabbage. Actually, it’s been sitting in the fridge for months and was quite tired looking. If you get a fresher one, perhaps you’d get a better color. Chopped the cabbage, put in a metal container, barely filled with water. The more cabbage, the better, only put as much water, as you need for the dye. I put around 300 ml for half a small cabbage. Boiled the cabbage in water for about 15 min., strained and squeezed as much liquid from the cabbage as I could. Got this sort of purplish color. Since I’m not a fan of purple, I added some baking soda, to turn the purple into teal. You could keep the purple if you like it, or add acid (vinegar) to change it more towards red. I didn’t do it, I like it blue. Added some alum. 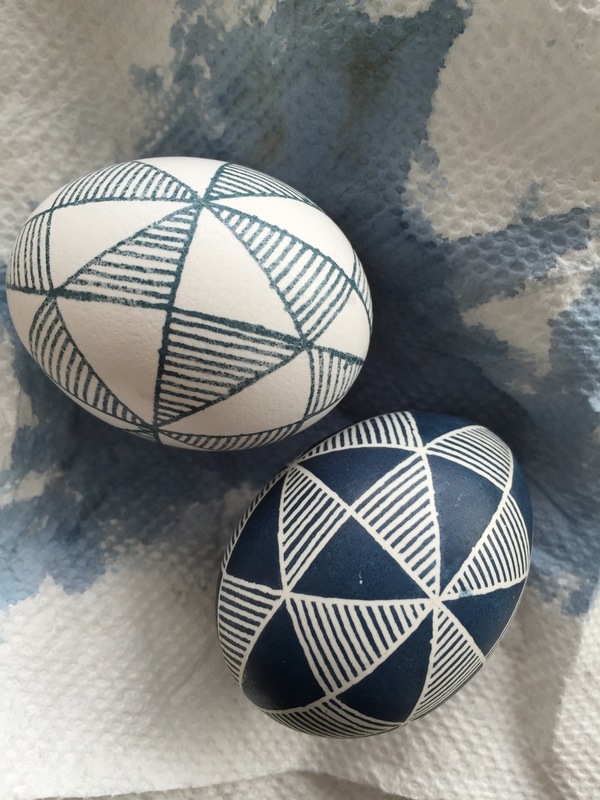 Here is what the white egg looked like after some time in the dye. On the left – olive green achieved with cabbage dye after coreopsis. With time I realized, the results are better when dyeing repeatedly, that is, put it for a while in the dye, then pull it out, let it dry and rest, and then put back into the dye again. 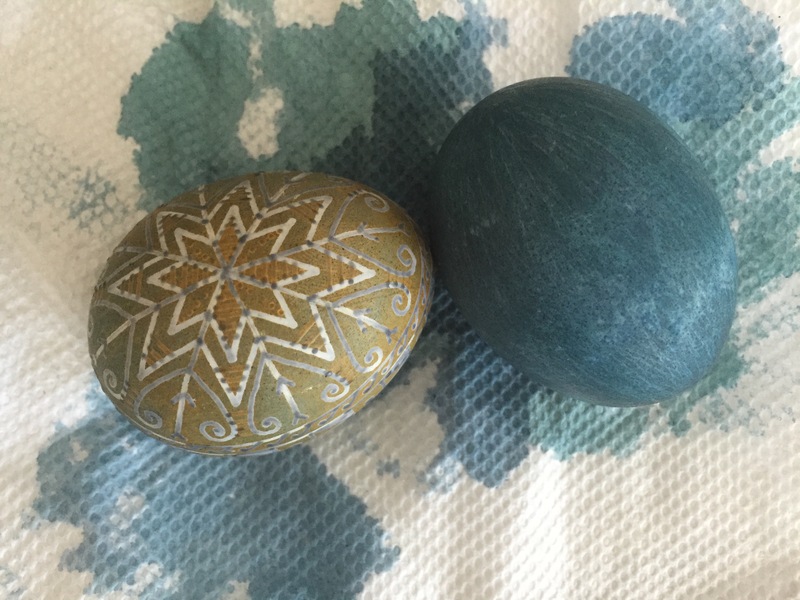 See the first photo – the blue background egg has been in the cabbage dye three times. The egg on the right was used to write on it and then was etched with vinegar. I made a mistake of washing the wax off with hot water, the dye did not like that and came off in some places. Regular method (though done quite carefully) of taking the wax off with the candle, worked much better with preserving the dye – you can see that in the first photo. The dye smells like cabbage, which is not particularly pleasant, but other than that does not spoil fast – I’ve had it for a month, most of the time it’s been in the fridge, and it’s still working fine. UPD. After some time the eggs are not smelling like cabbage any more, which is great. For more eggs died with this dye, see red cabbage tag. This entry was posted in fresh dyestuffs, green, Natural dyes, Recipes, teal and tagged alum, coreopsis, red cabbage. Bookmark the permalink. ← First experiments with natural dyes complete.